During the lead boat’s rounding the first weather mark, the mark was set adrift when the anchor line tether grommet was torn free via collision with the lead boat. The markset boat anchored with M flag flying about 100 ft upwind of the original position within several minutes. Some boats rounded just the offset mark, and some boats rounded the substitute mark. During the subsequent first weather mark roundings, the markset boat’s anchor line was cut by another competing boat, and she attempted to hold position via motor for the remainder of the fleet. Mark rounding records from three sources could not be reconciled completely to determine which boats properly rounded a weather mark, and which did not. During the roundings at the end of the second weather leg, the fourth boat to round again cut the substitute mark boat adrift, and again the boat had to try and hold station on motor alone. A large, but undetermined, number of boats rounded just the offset mark on the first lap. Some returned to round the M flag boat, but many did not.Therefore, some boats spent significantly more time beating to windward in the heavy current than others. A similar situation occurred at the second weather mark rounding, with the mark boat being cut adrift after four boats rounded. Records are of insufficient detail to determine the actions of the majority of the fleet on either windward leg. 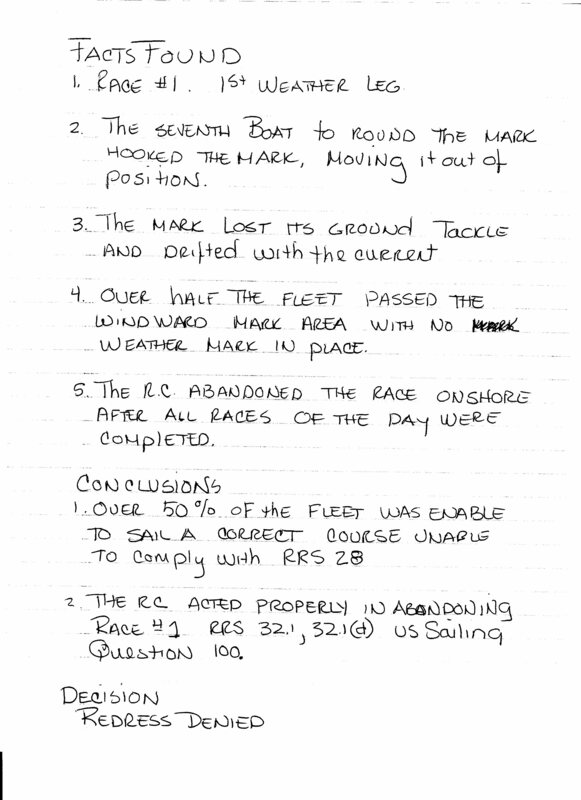 This was not a fair race for the fleet as a whole, and the jury directs the race be abandoned under RRS 64.2.